Tosi’s, in Stevensville, Michigan, is a beautiful Italian restaurant with a wonderful reputation for fine dining. One of their specialties is their Minestrone Soup. You can recreate Tosi’s Minestrone Soup at home. Heat 12 cups water to boil, turn off heat, add beans and soak for 1 hour. Add salt pork and simmer 1 hour. Saute onion, garlic, in oil until golden and set aside. Prepare vegetables, then add to beans with garlic, onions, salt, pepper, seasonings, tomato paste, and rice. At this time, you can also add 4 additional cups of water and continue to cook until thick. Puree in processor at least 1/2 soup mixture, and then mix with un-pureed portion. Serve with Parmesan or Asiago cheese sprinkled on top. Note: This is better when prepared at least 1 day before serving, and then re-heated to serve. Add either Asaigo or Parmesan cheese to the top. Thanks to Jess, a fellow viewer for this wonderful recipe. Charleston She-Crab Soup – enjoy a southern flavor with this recipe. Lolol, there is no rice or peas in the original recipe 🤣 in which I, myself do have! And, the northern beans are not dried beans, They are the ones in the glass jar at the grocery store and puréed! The reason for the difference in the typical red minestrone vs this northern white bean puréed to be creamy is the red sauce comes from a different location of Italy than where Emil and his mother Henrietta was actually from. Tosi’s whether at the restaurant in Stevensville or at Tosi’s cafe in St. Joseph, MI, the minestorne soup is creamy in texture. 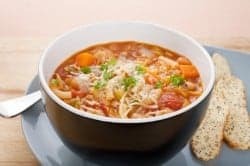 It isn’t like the typical minestrone soup everyone else makes with a thin broth and lots of vegetables. Whatever they use in their’s it gives it a creamy smooth taste and the soup is thick in texture with no chunks of vetables in it. The last time I had their soup was in 2012. It was to die for. It is the best minestrone I have ever had, and would love to know their recipe. This is not the Tosi’s Minestrone soup I know and love. The one served at the restaurant has always been minced/chopped and not watery and full of whole veggies. Need to check your source. you can purchase this soup in quart containers at Cafe Tosi’s in down town St Joe. The ingredients are listed on the label and there is no salt pork on that list. This was the recipe as it was written down by I believe Tosi’s , but that was awhile back. Restaurants do change their recipes from time to time. None the less, I enjoyed dining up there while I lived in the area.